Pouvez vous m'aider à satisfaire? The aircraft was assembled from spare parts and NEVER FLEW. Il s'agit de la seule photo connue du Nennig C3, engagé avec le N°4 par Mr Guy Bart dans l'édition de 1935 de la Coupe Deutsch de la Meurthe. L'avion n'a pas couru car il n'était pas prêt à temps (moteur Régnier R161-01 et capots-moteurs, notemment). It is the only known picture of the Nennig C3. 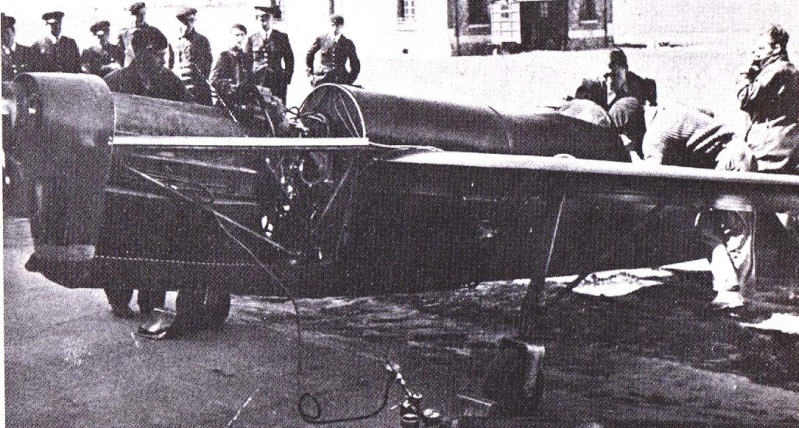 This plane was paid by Mr Guy Bart to participate to the 1935 Deutsch-de-la-Meurthe's Cup. Competition Number was N°4. It did not participate because the engine Regnier R161-01 and its covers were not ready in time. There is an article on Nennig C3 and C5, with drawings, in the french revue "Le Fana de l'Aviation" N°62. I like constructing micro RC indoor models - perhaps for pylon racing this would be an unusual subject. Indoor scale planes are rare in my community. I have been interested in French designs for many years - many have unique appearence. Thanks very very much for superb information.